H2 came over and took some photos of the seedlings I started. Not sure what's wrong with (some of) the tomatoes, but it doesn't look good. About half of them are affected by some kind of lesion. Mold? Blight? Wilt? Mystery Funk? Take a look at Cornell's Tomato Leaf Symptoms Diagnostic Chart and let us know what you think. I'm leaning toward Bacterial Canker. 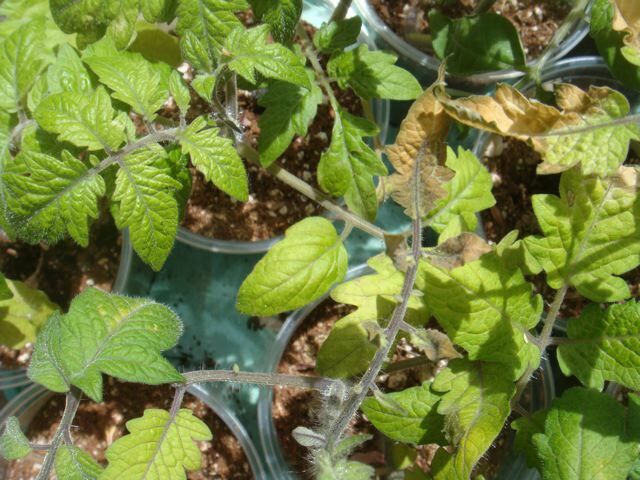 If you want a second opinion, head over to the Texas A&M tomato problem solver. 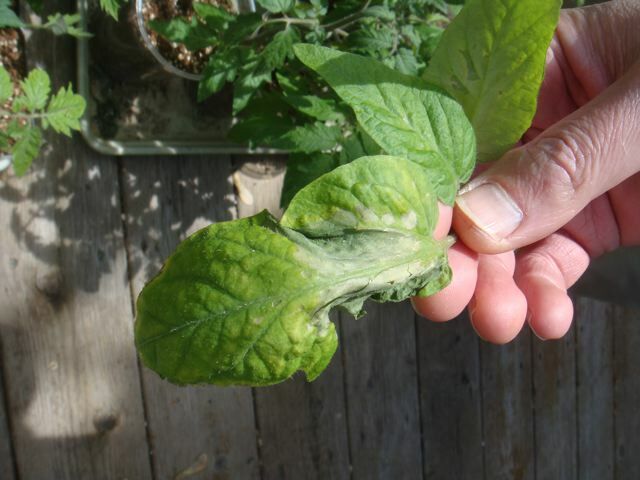 About half of the tomatoes have been hit with this. After seeing how these diseases can wipe out full grown plants, we took plenty of precautions , e.g. 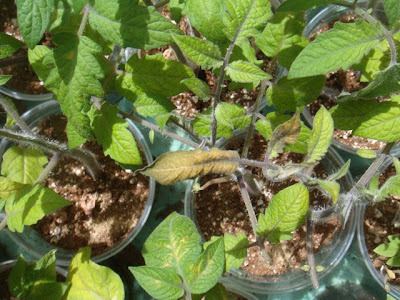 bleaching old containers prior to using them, to prevent any kind of contamination from affecting our tomato seedlings. Somehow that wasn't enough. Right now only half of them show signs of being damaged, I'm hoping that the other half will stay healthy, but who knows. Some good news. The eggplants are going strong. 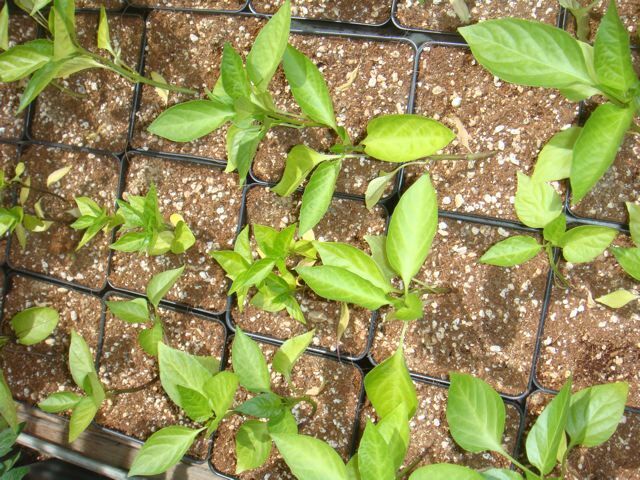 Peppers - anemic, but some new growth. They should make it. This is so sad. I've been trying to get over it for the last few hours, but I'm glum. One of the compelling reasons for starting our own tomatoes from seed was to avoid the blight/canker/other cooties that hit the mass-grown plants last year (athough I should add we all got some kind of blight in 2009 due to the extremely wet conditions). 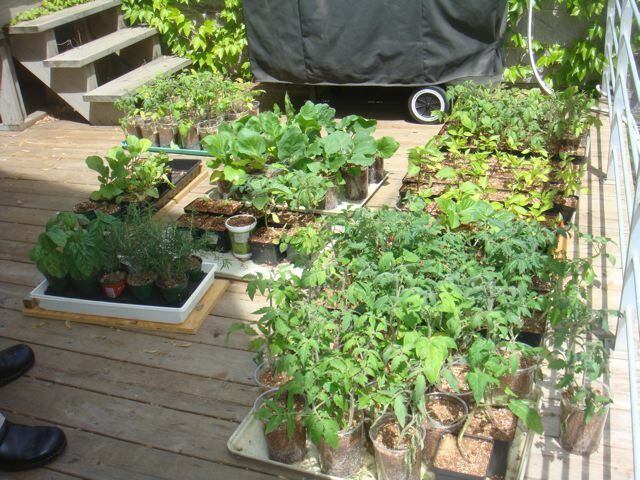 Plus, Bruce grew at least a dozen varieties, with some remarkable Franchi seed selections provided by one of our local readers. Thanks Debbie! When I ponder the lovely hours spent planning for early, mid-season, and late tomatoes, my heart sinks. Now we're trying to source heirloom tomato starts locally. Wish us luck. Menard's on Clybourn has pink Brandywine heirloom tomato starts. Bruce is going to check Green City Market tomorrow and we may have a reader with Franchi starts to share. My sweet peppers all look great. However, the jalapenos and paprika peppers look like yours... kinda yellow and not really growing. Any suggestions!? My peppers are starting to look a little better now that they're planted. 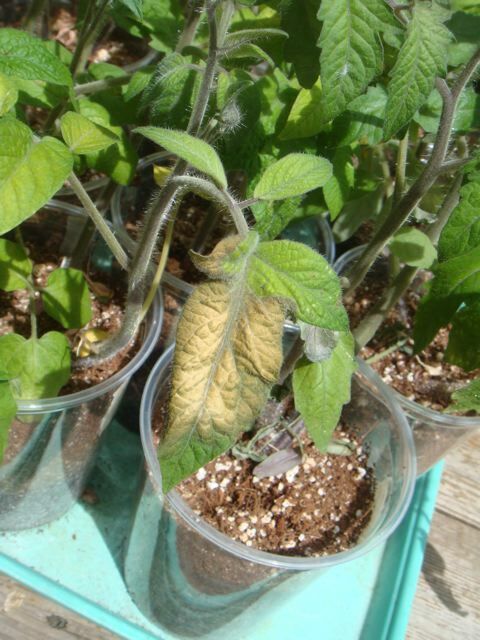 "the yellowing of leaves is almost always caused by a lack of nitrogen and magnesium in the soil. Normally this is a result of the nutrients being leeched from the soil due to excess water. 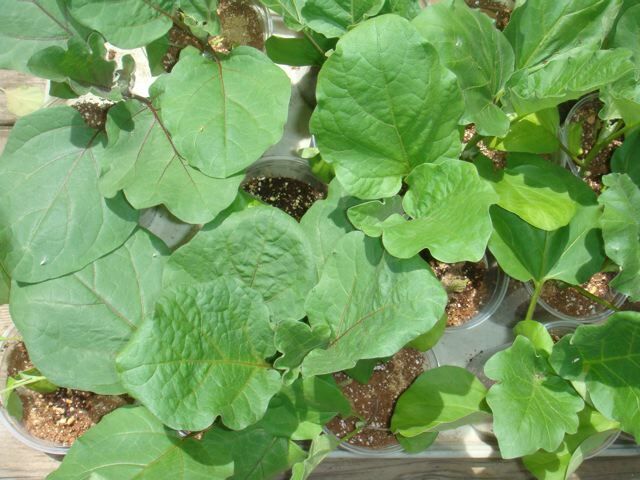 Only give the plants 1" of water per week. However, it may simply be that the plants require an application of fertilizer high in nitrogen to get past the problem. Normally I would not recommend a high nitrogen application for peppers ot tomatoes. This will usually result in lush foliage at the expense of a strong harvest. However, you need to get the plants healthy again, so this is definitely an option. One other thing that has worked for me in the past is applying epsom salts to my pepper plants. Epsom salts supplies magnesium and calcium and is absorbed by the leaves for a quick recovery. You may want to use this as a foliar spray (3 tbs. per gallon of water) and then apply a granular slow release fertilizer high in nitrogen. Note: I would remove the flower buds this one time in order for the plants to concentrate their energy solely on the foliage. You still will have plenty of time for a fruitful harvest." Mine perked right up when I planted them in a SIP with the regular fertilizer ring.